When traveling in Sweden with my family last year, I saw, for the first time, these Water Walking Balls offered in a large public park on an above ground inflatable pool. It looked like a lot of fun, and only cost a few dollars for 10 minutes. 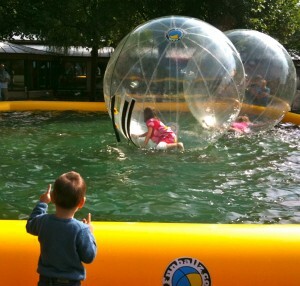 My son was too young for it then, so we just watched the other kids “walking/crawling” on water inside these balls. Here is how it works: a person climbs inside a large, see-through plastic ball, the ball is inflated with a blower and then closed with a zipper which makes it airtight. The ball is then pushed onto a body of water and as the person tumbles around inside, the ball stays afloat. Although it looks like a blast, it can be quite dangerous. On March 31st, 2011, the U.S. Consumer Product Safety Commission released an alert about exactly this type of product, warning of danger of drowning, suffocation, and impact injuries. According to the article, “CPSC does not know of any safe way to use this product.” To read the complete article from CPSC, CLICK HERE.